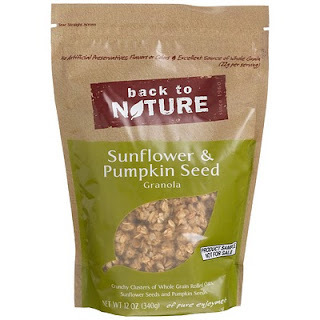 Found some fun looking granola on sale at Publix last night - so I'll be snackin' on it today! I got the sunflower and pumpkin seed variety. It's not labeled gluten-free, but there are no unfriendly ingredients in it that I can see. Amazon does say it's processed in a factory that processes other products with wheat, milk, and soy. Whatev. I can deal with that. You'll notice that I do eat a lot of seeds. That was another big thing Dr. Liu wanted me to do - and she especially mentioned pumpkin seeds and sunflower seeds, so I do try to eat my fair share of those. They are high in fat, but it's good fat. And they fill you up and have a great protein punch, so seeds make a great snack. I made some chicken salad this morning and threw sunflower seeds in - I love the nutty flavor and crunchy bite they add. My doctor also mentioned eating fruits with seeds (where you actually eat the seeds), like berries, seeded grapes, etc. So you'll see that the fruits I eat usually have seeds as well. Hope y'all have a fantastic Tuesday! I've got my eye on Friday. * Note that because I don't have "true" allergies to gluten or dairy, I'm a little forgiving when it comes to things like small amounts of margarine/butter, or certain sauces that probably have a little of either of those. I generally just try to eliminate the obvious things and do the best that I can with the rest! So if you have a real intolerance for gluten or dairy, you may need different options. I will star these items that may contain some wheat or milk. Ooh, I could go for some pumpkin seeds. Good thing it's almost October! Alrighty...I tried to leave a comment but got some weird error message but wanted to say hi and hope your hubby is enjoying his new job! A 2post-combo comment: I love how close you guys are to your parents. You write about them often, and it's so lovely. You're blessed. Also, so happy about the "hubs" getting a job! SO happy for you both! Thanks for sharing your meals, I've been curious. I'm trying to work on my "digestive issues" (sorry tmi! )and it's been helpful. One more thing, back to Nature sales Gluten-free crackers too. You can find them at Target.:)! "Dolphins are just gay sharks." Are you ready for your makeover?! Woo hoo! It's a Giveaway! Moo Goo to the Rescue!